A 26-year-old 100 per cent visually impaired student from Kolkata has battled all odds to make it to the prestigious management school – IIM. The IIM dream, chased by many but realised by few. 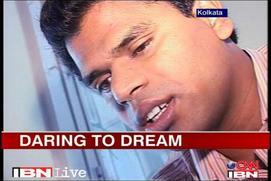 26-year-old Suresh Reddy from IIM Calcutta belongs to the select club. He was 13 years old when he lost his vision. His parents asked him to quit studies, but Reddy fought on. Armed with new technology and helped by friends, he cracked the IIM entrance – the first person with 100 per cent visual impairment to get admission into the elite management school. “My credibility of carrying an IIM tag should compensate. If I say I am from x school people just walk off. If I am from IIM, people will pay at least one second attention. It is that one second that I am looking for,” said Suresh Reddy. In an intensely competitive world, Suresh spends his every waking hour on studies just to be at par. For many at IIM, he is an inspiration. “Lots of people have told me that they find Suresh’s story very inspiring and I agree, we thought we were the smart ones getting through IIM but look at this guy, he has achieved something,” said Sri Vatsavan. But it’s not just the students of IIM Calcutta who see Suresh both as an inspiration, the institute too thinks he is both a challenge as well as an opportunity. From scanners to e-books to giving extra attention, the institute too is finding ways to help Reddy. “He has been also exemplary in his efforts to study and learn things,” said Professor Prashant Mishra, Chairman, Post Gradutate Programme. But above all,it’s hope and self-belief that drives Reddy. “I have no other choice but to be optimistic and at least to follow if not to lead,” he said. This entry was posted in Uncategorized and tagged First Visually impaired student to join IIM, IIM, inspire minds, Inspiring success stories, Suresh Reddy. Bookmark the permalink.